Here we go. Appears you had it exactly right. I saw this on a website with old logos a couple of years back. Thought it was cool so I copied it. Rick, I had no camera savey in those days. Got negatives for these photos from the original track photog years ago. A lucky find! You're right though, a lot of these cars could have used a little professional help! There actually was a sign guy in Sidney, but I wasn't smart enough to track him down and watch him work, even though I had a real apprecation for race car lettering. Model cars were my canvas back then. The Lafler brothers cars were lettered by their sister who had a professional art background. Some good examples of early stock car lettering can be found in the W.A.R.C. book, such as the cars at Speedway Park in Ft. Collins. I've shown a couple below who were sponsored by sign shops. Don't know where Buckley Signs was, but Asmus Signs was a Ft. Collins Sign co., and has an ad in the W.A.R.C. book. Still listed, think I'm going to go find it. His competition in Ft. Collins was a Don Brown. There are examples of both their work around town, according to the web. Indybigjohn that logo was as I remembered it to the best of my recollection. I first saw it on the back of a '37 Ford Fordor flatback, one of those shown below. Saw it on a car out at the Ideal Stone business so am assming it was the #23, but? Of all the photos I acquired from the track photg, haven't run across one showing that logo. Do remember it appearing professionally painted. All from 1951 are #15 unknown, #19 Whitey Hrbeck, and #23 Bud Trotter. Fewer and fewer of these guys still around. I'm glad you've saved and archived this bit of racing history for us, Bill. I've reread this thread a few times over since you started it a couple years ago. I just love those old "Jalopy" stock car pics from the '50's era of racing. Wish I could have experienced those type of races first hand, what a fun time I'm sure it was. Great that you've added more memories and pics to this story recently. The excitement you experienced as a kid really comes out in your words, which I can totally relate to when I was real young in the '60's and would spot those old Figure Eighters at a gas station, or in a field, and then got to watch them run out at Englewood. A very exciting time for me which I'll never forget. Like you, I can still vividly see and remember the colors of the cars. Great stuff here! Thanks for sharing. Last edited by Jerry Lee; 05-07-2012 at 11:43 AM. Reason: ..spellcheck! [B]SUNDAY OCTOBER 14TH, 1951, 61 YEARS AGO! [B] Late in this 1951 season, they were still racing, although this would be the last Sunday. 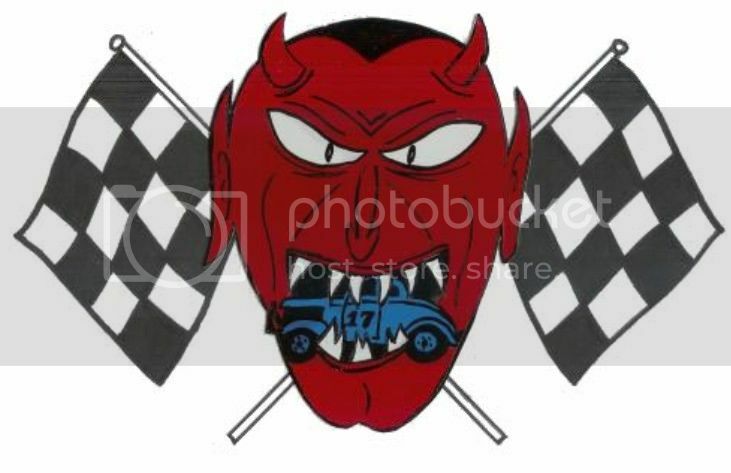 Not every racing group raced this late into Fall, but during these start up years the Devils Motro Club was still at it. It had even snowed one Sunday, but on this day, the track looks pretty dry. Below are a few photos from that date. Can't tell who that is on his side in photo #1, but from the looks of the left front wheel of #2, must have tangled with the it in the process. Mo Gordon's wrecker is on the scene. Several cars got on their lid during that last race of the season including #48 in photo #2. Curly Dogget won the trophy dash earlier that day, then got his #5 upside down later on shown going over in photo #3. He'd debut a new car for 1952. Photo 4 shows Mo Gordon with his older GMC tow truck in front of his wrecking yard. The #3 behind the fence was through for the season. As kids we would go down to the lower yard behind this one and crawl through the wrecked stock cars just to see what it felt like sitting in the drivers seat. The final photo is another action shot. This time it's #88 tearing up his car. Lasted the whole season until this Sunday! Guess that was enough for him, for there was no #88 the next season. Again Bill, great stuff you're posting here. One of my favorite eras in stock car racing. I hope you have some more pics stashed to post in the future. Enjoyed your article. My Dad was Robert Lafler #77. I was too youg to remember much but he still has a lot of the race programs and a few years ago I was given over 200 photos of the drivers who raced in Sidney, Nebraska and Sterling, Colorado. We are in the process of getting all the pictures scanned. dlaffarm, happy that you contacted this site. Made my day, knowing that there is more out there. Just as I was getting ready to post more photos. I've forgotten many of the names so looking forward to what you have, especially programs. Welcome aboard. Here we are again, Sunday May 4th, a memorable day for me, only it was May 4th, 1952. That was the first race of the season for the Devils Motor Club and I couldn't wait. Here are a few more of those cars that turned out that Sunday. Not sure who is on the left, but on the right in the photo of #4 is Frankie Mathes, car owner. Seems like he did some of the driving too. #0 was one of the MAYFAIR cars, both owned by Tom Kahloff. Don't remember who drove. MAYFAIR was a Frontier service station/cafe. #98 was a big old '41 Oldsmobile four door, but seemed to move pretty well for a large car. Pete Rapp was both owner and driver of #9, and Curley Dogget brought out a new purple and white coupe, #5, the first of three cars that he would go through that season. just behind him is another four door, #79 1/2. Ratrod66, there was a car from Ogallala, one from Peetz, CO and three from Haxton, CO, but believe the others were all from Sidney and the farming community around there. I don't have another #100 in my photos. However, I pitted for one of my H.S. classmates who mentioned to me several years ago that when he travels via Hwy 6/34 back to the Husker games he had noticed several early stock cars in a wrecking yard near McCook. Guessing they might be from that same racing organization you mentioned. Thanks for the thoughts, gives me something else to research.